Cedar Hill Lodge - (Shimla) - Himachal Pradesh. : Chandratal - The lake that belongs to the Moon. Chandratal - The lake that belongs to the Moon. Chandra Taal (meaning the Lake of the Moon), or Chandra Tal, is situated at an altitude of about 4,300 metres (14,100 ft) in the Himalayas. Mountains of scree overlook the lake on one side, and a magnificent cirque presents a view on the other. The name of the lake originates from its crescent shape. 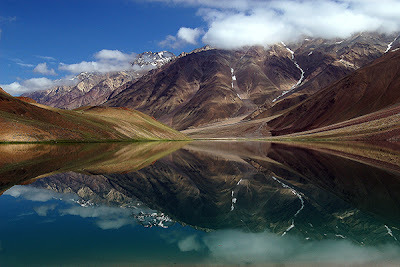 Situated in the Spiti part of the Lahul and Spiti district of Himachal Pradesh (India), Chandra Taal is a popular destination for trekkers and campers. The lake is accessible on foot from Batal as well as from Kunzum Pass from late May to early October. There is also a motorable road from Batal which is 16 km (9.9 miles) away from Chandra Taal, but before August, its condition can be bad. The road from Kunzum Pass is accessible only on foot, and it is about 8 km (5.0 mi) from Chandra Taal. Suraj Tal is also accessible Chandra Taal, 30 km (19 mi) away. Vast meadows on the banks of the lake are the camping sites. During springtime, these meadows are carpeted with hundreds of kinds of wildflowers. The lake is situated on the Samudra Tapu plateau, which overlooks the Chandra River. The lake is one of two high-altitude wetlands of India which have been designated as Ramsar sites. Boasting of a circumference of about 2.5 kms, the deep blue-water of Chandra Tal Lake is the source of the Chandra river. This crystal clear blue water lake lies in a broad grassy plain, which in ancient times was a glacier, Idle for camping, can be approached from Manali and by Kaza.